I've begun a new blog. Yes, another. This one charts my progress on my RSA presentation. In fact, it will be part of my RSA presentation. The folks in my Writing Web 2.0 class are working on their final projects for the next five weeks. So I'll be working on this RSA presentation alongside them. In the Web 2.0 class last week, I asked everyone to find something on Wikipedia that they knew a lot about and to edit something on the page. I decided to do this because so many of the folks in the class had been blogging about how they couldn't imagine editing a wiki and didn't really like the idea of wikis because someone might come along and mess up what's written. Luckily, SZ's excellent presentation on Tuesday about her own wiki helped to dispel some aversion toward wikis. But, still, I wanted writing to happen. So we all edited on Thursday. As I was illustrating to the class what I wanted them to do, I had to think quick to try to find an entry I thought I would be able to edit. What popped into my head? Peter Elbow. So I went to his page, which is in fact surprisingly short. I edited it by adding a word to one sentence and then adding an entire sentence that linked to another Wikipedia page. That was my contribution. The most popular pages for the folks in the class were their high school pages. Some of them had to start from scratch, while others were able to add just a sentence or two to already existing pages. A couple of students after class blogged about still not wanting to contribute to wikis. But what struck me about the activity is how much, really, it IS writing. There's the myth of the author, of course. But didn't the author die in the 60s? Why is that specter continuously haunting acts of writing? What is writing if it's isn't adding a little bit to what's already accumulated? Even when we're writing a whole entry (or paper or book or whatever) ourselves, we have to accumulate. Aggregate. Select. Then create some sentences. Go back and add some words. Write some new sentences. The wiki. It *is* writing. That's what I say. 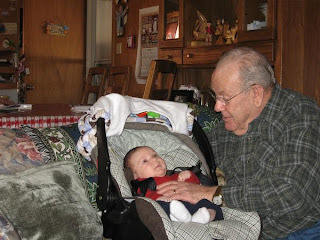 I stole this pic of my father and my newest great nephew from V's MySpace page. When I went to Texas for Thanksgiving, my dad was having pretty severe memory problems. But he remembered this little guy was supposed to be arriving. I was away Friday through Sunday, at a retreat for teachers in Barre, Massachusetts. The retreat itself was wonderful: I met some fabulous people and spent a significant amount of time in silence. Also, it snowed Saturday morning. I had expressed concern the previous evening about the upcoming snow. I don't think I'm ready--that's the gist of what I said to folks at dinner, most of them New Englanders, who seemed to believe I must be used to lots of snow. I don't have a hat, I complained. I wore the hat later as I walked up the little road that led to another retreat center. The snow was barely falling then. Mostly I heard the snow compacting under my feet. When I stopped, I could hear birds sing. So it was all lovely, lovely. Then the return late Sunday. It was fine, until the very last bit. And that's the bit you might not want to know. Rain in Kansas City. A tiny plane bouncing through the storms from Kansas City to Columbia. I didn't mind. I felt peaceful. But my gut--well, it had other thoughts. I had to reach for the bag. You know the one. And then when we landed, my one piece of luggage didn't arrive with me. So the next day, no hair dryer. No moisterizer for my dried out face. And on top of it all: a very bad headache. But I'm all better today. And, yes, able to remember what a beautiful weekend I had, after all. Plus, reading the blogs from my class: another pleasure. Thanks, all.